The American physicist William (Willy) Alfred Higinbotham (25 October, 1910—10 November, 1994) is credited with creating the first computer video game to display motion and allow interactive control with hand-held controllers in 1958. William Higinbotham earned an undergraduate degree from Williams College in 1932 and continued his studies at Cornell University. During WW2 he went to work on the radar system at MIT. In the later years of the war he worked at Los Alamos National Laboratory (where the first atomic bomb was developed) and headed the lab's electronics group. 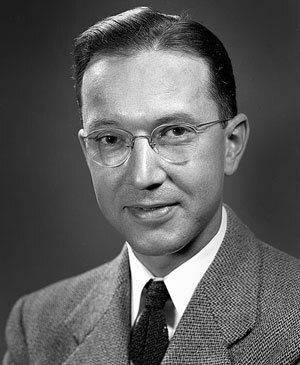 In 1947 Higinbotham entered the Brookhaven National Laboratory in Upton, New York as a senior physicist and later as head of the Instrumentation Division. When in October, 1958, the Lab organized its annual Visitors Days, Higinbotham realized how static and non-interactive most science exhibits were at that time tried to change that, introducing a game as an element of entertainment. He wrote later it might liven up the place to have a game that people could play, and which would convey the message that our scientific endeavours have relevance for society. Higinbotham decided to create a game—Tennis for Two, and despite of the fact, that he had only two weeks for this purpose, he managed to make it, with the help of two of his colleagues—David Potter and Robert Dvorak Sr. They created a unique way to alternate among the computer’s outputs with the transistor switching circuit, creating the image of a tennis court and allowing players to control a movable ball seen on a screen, just like a modern video game. In 1983 Higinbotham recalled—It took me about two hours to rough out the design and a couple of weeks to get it debugged and working. It didn't take long and it was a big hit. The Tennis for Two was first introduced on 18 October, 1958, at one of the Lab’s annual visitors’ days. 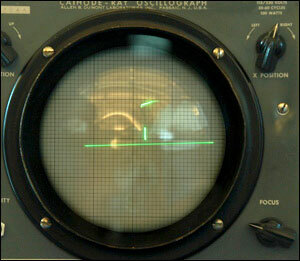 Two people played the electronic tennis game with separate controllers that connected to an analogue computer (Systron-Donner Model 30) and used an oscilloscope (5-inch in diameter DuMont cathode-ray) for a screen (see the lower photo). Visitors playing Tennis for Two saw a two-dimensional, side view of a tennis court on the oscilloscope screen, which used a cathode-ray tube. The ball, a brightly lit, moving dot, left trails as it bounced to alternating sides of the net. Players served and volleyed using controllers with buttons and rotating dials to control the angle of an invisible tennis racquet’s swing. Liven up the place it did! Hundreds of visitors lined up for a chance to play the pioneering electronic tennis game. And Higinbotham could not have dreamed that his game would be a forerunner to an entire industry that less than fifty years later, would account for $9.5 billion in sales in 2006 in the USA alone. In 2017 the global games market reached $109 billion! In the next 1959 year’s Visitors' Day an improved model of the game was presented, as the modifications included a larger monitor, a button to increase the force of a serve and changeable gravity effects to show what it would be like to play tennis on another planet :-) Though the game was again the highlight of the exhibition, this was its final appearance. Higinbotham soon forgot about his game, moving on to pursue more important scientific endeavours. Higinbotham had more than 20 patents on electronic circuits to his credit, but he never patented his video game, which associates said was the forerunner of the early 1970's video game "Pong". Higinbotham, discussing in 1983 his decision not to seek the patent, said, "It wasn't something the Government was interested in" and that he "didn't think it was worth it".